We hope in this next year that we will be in contact with more willing participants, and hope that will present more new discoveries. We wish that we could give everyone the gift of ancestry. Contact us! Howard Whitney of Texas. Descendant of Samuel Whitney of Bermuda. Bobby R. Whitney of Oklahoma. Descendant of Samuel Whitney of Bermuda. Clayton E. Whitney of Texas: Descendant of John Whitney of Watertown, Ma. Roy H. Whitney of Georgia: Descendant of Samuel Whitney of Bermuda. Michael Dean Whitney of Missouri. Jerry D. Whitney of Missouri. We hope this site will inspire other people of the Whitney surname to join in, and participate in the exchange of information. We have put this site together in hopes to come in contact with other Whitney's. We are dedicated to researching the Whitney surname, and have studied countless Whitney families in the American south. Some present day lineages are disconnected from their ancestor, and we hope to reconnect these family lines to their rightful immigrant by a simple DNA test. Our research has concluded that there are three principle immigrants who are responsible for most of the Whitneys living in the United States today. Do you know which one know which one you belong to? Henry Whitney, of Long Island, NY. Samuel Whitney, of the Bermuda Islands. The following graph shows how successful (or as it seems in this case unsuccessful) The Whitney Newsletter is after one issue. 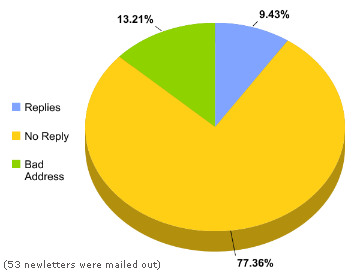 The numbers do not look that encouraging, however some of the "no responses" could turn up yet as "responses". This would be more discouraging if the newsletter had been mailed to hundreds of people. Volume 1 - November 2011 was sent to roughly 50 people. The amount of replies to the newsletter have been few. Without volunteers we can not establish the connections that we need to make. The more time that goes by, the more that is lost. The Whitney Newsletter can now be viewed online from the Newsletter link in the main menu above on this page. The newsletter explains our purpose, and our attempt to convey how important our research is to us, and how you can participate. The newsletter, envelopes, business cards, return postage expenses, and don't forget to include printer ink (which is not cheap!) are 100% out of our own pockets. We will never ask you to donate or help fund this website ever! If we can not continue to afford hosting this site, we will shut it down. hits since Jan 1, 2012.